Every Valentine’s Day we are reminded about the importance of showing our commitment to our lovers – whether we are married to them or not. For some people this might mean getting a tattoo of their lover’s name (or initials). No figures are available about the number of people who choose to demonstrate their commitment in this way. But a quick online search will yield tens of thousands of images, videos, discussions and opinion pieces about getting a lover’s name tattooed, dating someone with a tattoo of an ex-lover’s name and the ubiquitous curse of the name tattoo. According to this curse, getting a tattoo of a lover’s name dooms a relationship. The sheer number of posts on social media suggests that this is a much sought-after expression of commitment. And recent research backs this up, finding that a common reason for wanting a tattoo is to pay tribute to a partner. True to the era of sharing that we find ourselves in, celebrities are quick to display any new tattoos for their fans. Just recently, socialite Paris Hilton took to Instagram to share with her 7.2m followers her actor lover Chris Zylka’s new tattoo of “Paris” on his left arm.Celebrity ink lovers certainly seem to have caught on to it. Among the best-known are David and Victoria Beckham. Victoria got the initials “DB” on her left wrist in 2009, and David got “Victoria” on his right hand in 2013, as tattooed symbols (two of many) of their commitment to each other and their relationship. Such demonstrations of commitment date back many centuries. For example, in 18th-century Japan – a period considered to be the golden age for tattooing in the country – a female courtesan might show her commitment to a male lover by having his name tattooed on her upper arm. And, often the Japanese word for life (inochi) would be tattooed alongside the lover’s name to signify the courtesan’s hope that the commitment would be of the death-do-us-part kind. The biggest problem with getting a tattoo of a lover’s name hasn’t changed either. In the 18th century, like today, not all relationships lasted a lifetime. And when the commitment between the lovers ended, the tattoos were no longer desired. They could, of course, be removed. Two methods used in 18th-century Japan were to burn them off with the bowl of a tobacco pipe or to burn them off with dried mugwort leaves (which are very inflammable). However, either method would almost certainly have been painful. And both methods would likely have left permanent scars to remind the lovers of their failed relationship. Fortunately, modern methods of tattoo removal no longer necessitate burning off tattoos. However, one of the main reasons people get a tattoo removed nowadays is because they have broken up with their lover. According to Premier Laser Clinic after a five-year study, the most regretted tattoo (and the one most frequently removed) by customers at their clinics was an ex’s name. 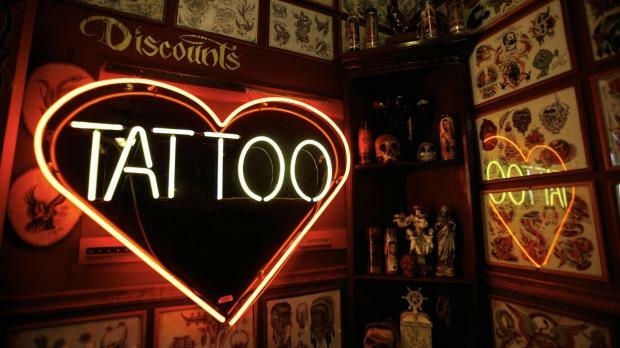 Certainly, many current celebrity ink lovers (Mel B, Melanie Griffith, Kylie Jenner and Heidi Klum to name just a few) have found that their tattoos of lovers’ names lasted longer than their relationships. And so, having already spanned centuries and continents, the problem with inking a lover’s name on your body continues to endure.